The SC-6 HD Recovery Charger allows you to 'revive' and charge up to six 12V lead acid batteries simultaneously. Each charging station operates independently of the others, allowing you to charge any combination of lead acid battery types (VRLA, AGM, flooded and gel cell) at the same time. The SC-6 features a compact, portable 'suitcase' configuration, allowing you to carry it easily to wherever your batteries are stored. Each independent charging channel profiles the condition of the connected battery, and automatically runs through the individual recovery and charge cycle needed. 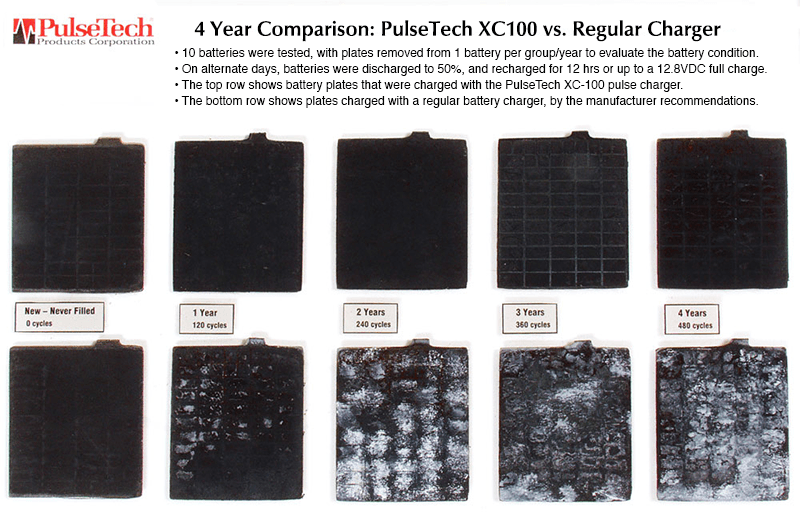 PulseTech's patented pulse technology removes sulfate crystal buildup from the battery plates, restoring them to peak condition, and extending the life of your batteries up to 5 times. Ease of use is one of PulseTech's hallmarks. The SC-6 gives you one-switch control over the recovery/charging process, with 5 LED indicators per each channel, showing the battery's condition at a glance (battery disconnected, bad battery, recovery charge, pulse charge, charge complete). There is no danger of overheating or overcharging, no matter how long the batteries stay connected to the unit, so you don't need to constantly monitor them.